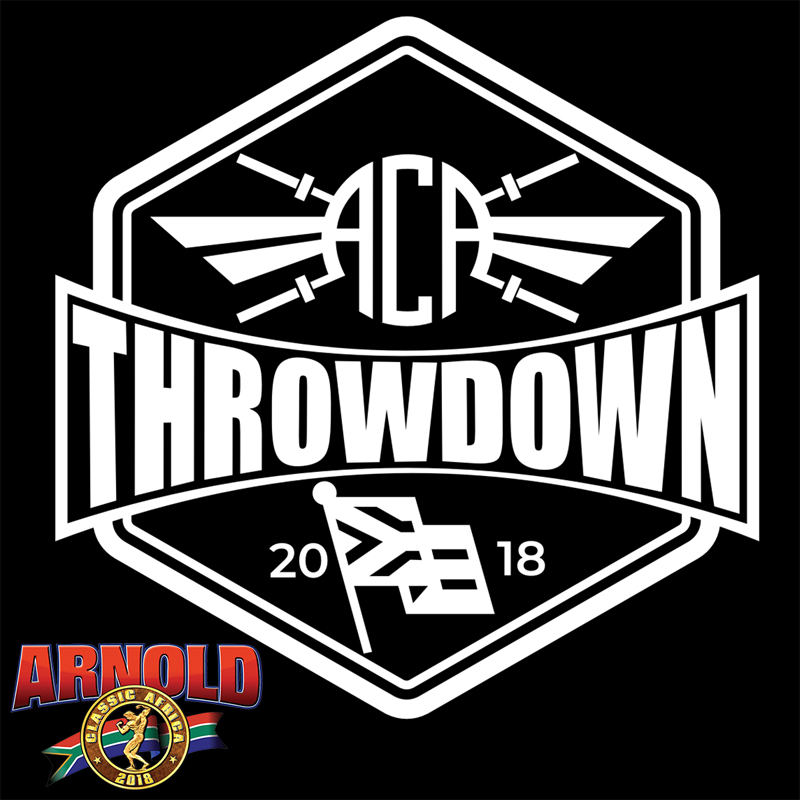 I, Michael Maritz, promoter of the ACA (a cut above) Throwdown held at Arnold Classic Africa Sport festival is very excited as count down officially began to the 3rd Throwdown. I am so looking forward to see you all in action at the Throwdown. The magnitude of the Arnold Classic Africa Sports festival will blow your mind as 58 sporting codes with over 16 000 athletes and 75 000+ spectators will partake in it. This year we have a much bigger space and also very spectator friendly. We will be situated on in the middle of Level 2 Exhibition floor. One of the main features and highlights of this event is that the legendary Arnold Schwarzenegger will visit all the sporting codes during the course of the weekend. He did visit the ACA Throwdown in 2016 and in 2017 he decided to sit down and watch an entire heat and got very excited saying his famous line “ILL BE BACK”. If this scenario repeats itself, it may cause a delay in the program. So please bare with us. The mission of this ACA Throwdown is to bring together the Functional/CrossFit community from all over the country to compete for the title fittest team in South Africa. The programming for this event will cater for advance; intermediate and beginner athletes. Payment must be made within 12hrs of registration or your registration will be void. You can pay via PayFast. ACAT does NOT reimburse any payments after registration is complete, if your team can’t compete it’s up to YOU to find a replacement. You must inform the ACAT team of any such changes by no later than 30 March 2018 at michaelmaritz@lantic.net. Your entry fee will include the following: T-shirt, goody bag and weekend pass for the duration of the Arnold Classic Africa 2018. Any changes with regards to; team name; team member or division has to be done before closing date 4 April 2018. Ensure that all team members have been added, with all the relevant and correct information as it is VERY important for accreditation. Wrong information will lead to NO accreditation and/ or NO participation. The ACAT is a three-day event (18-20 May 2018) and yes all athletes have to be present from Friday 18 May 8AM. Teams of 3 will work as follows: only 2 athletes WOD at a time and this can be changed in any way the team finds fit although no changes can be made once the WOD starts. In the case of a serious injury with regimentation from medic/head judge the reserve athlete will be used to complete the WOD. No additional time will be added. Team of 6 will work as follows: only 4 athletes (2male & 2female) WOD at a time and this can be changed in any way the team finds fit although no changes can be made once the WOD starts. In an event of a serious injury with regimentation from medic/head judge the reserve athlete may be used to complete the WOD. Registration and hand out of goody bags / t-shirts will take place Friday 18th May from 8am to 10am sharp at the Throwdown arena (Level 2 Exhibition floor Sandton Convention Centre). The movement standards for the for the ACA Throwdown will be the same as for the CrossFit Open 2018 and we urge you to Participate in the CrossFit Opens 2018. To judge at the ACA Throwdown you must have successfully completed the 2018 CrossFit Online Judges course and actively be involved by judging in the CrossFit Open 2018. If you are interested please send mail to Marius at mariusrohlandt@gmail.com for approval. WOD 1,2,3,4&5 will only be released on 1st May 2018. Questions on WOD’s will only be answered at athlete briefings. Sunday 20 May: WOD5, after this WOD the top 6 RX teams will proceed to the final “WOD6”. Day 2 & 3: Sat/Sun 19/20 May 2018 will work on the results of day 1. All athletes/officials/sponsors/partners of the Throwdown have to complete and sign the online waiver form which will also be available in hard copy at registration table on 18 May 2018.